There are two main advantages that Warwick Estate’s Big Five Safari has over other Big Five game drives. The first, of course, is wine. The second is that you’ll never leave disappointed – you’re guaranteed sightings of each one of the Big Five in question, for we are not talking wildlife here. Warwick’s Big Five is comprised of the quintet of South African wine giants – Cabernet Sauvignon, Sauvignon Blanc, Pinotage, Merlot and Cabernet Franc. Authentic safari vehicles take you deep into the vineyards, en route they liken each of the five grapes to one of the real Big Five. If, like me, you like to play guessing games and fancy trying to work out which grape reflects which animal, you might like to place you bets before you read on – consider this a spoiler alert. We climbed into the truck feeling a little sad that we weren’t actually going game spotting, but any disappointment was washed away at our first stop with a post-breakfast glass of the sublime Professor Black Sauvignon Blanc. 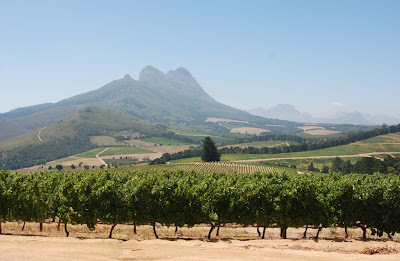 Enjoying the signature winelands view of endless mountains and unrivalled beauty, we sipped and learned why this is the rhino of the wine Big Five. This was the most tenuous comparison – there being more to both than meets the eye – but others are really rather clever. Cab Sauv, the king of the wine industry, can only be the lion; Pinotage, like the buffalo, stands its ground (when blended with a Cab Sauv. N.B. blending a buffalo and a lion is not recommended); Cab Franc is the elephant of grapes, with its thick skin and resilience to pests, while Merlot, like the leopard, presents a challenge. Just as you don’t always get a glimpse of the latter on a game drive, you don’t always get a good glass of the former in South Africa. Warwick’s tour is quirky and fun, but more than that it offers real insight into the grape growing process, something often overlooking on winery tours. If you’ve ever wanted to learn to identify a grape from its leaves, know which variety craves cooler weather or why French oak is favoured over South African oak then this is your tour. And even if those things aren’t near the top of your must-learn list, the Big Five Wine Safari is a great way to spend an hour – sipping Sauvignon Blanc alongside the vines that produced it and following up with a tasting of Warwick’s excellent vintages back at the winery. I might have failed to rise to the challenge of identifying the grape from looking at the vine; I might have failed to match the grapes to their animal counterparts but I fared well at working my way through their tasting menu and succeeded at sipping from the famous wedding cup without spilling a drop. It seems I know where my strengths truly lie. 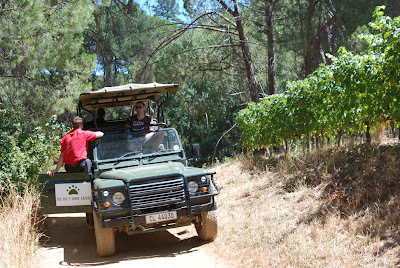 Warwick’s Big Five Wine Safari costs R50 per person, leaving every hour from 11am to 4pm. Bookings recommended. Tastings cost R25 per person and gourmet picnics are available to enjoy in the grounds.